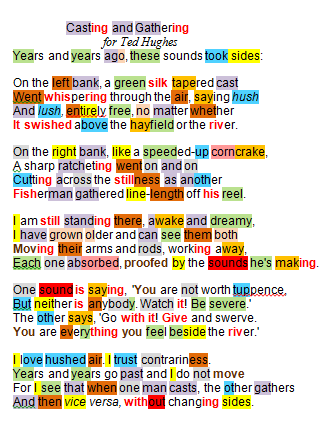 A river marks the uncrossed line between two fly fishermen who, when their turn comes to comment, represent very different attitudes – the poem takes on an elegaic tone. Heaney does not tell us who is who though we do know that he ‘accompanied’ fellow poet Ted Hughes and artist-friend Barrie Cooke on some of their joint expeditions. He delves far back in time (years and years ago) reflecting on their irreconcilable viewpoints: these sounds took sides. On one bank, behold a man whose fishing-fly speaks for him: green silk tapered cast went whispering through the air), a symbol of calm abundance (saying hush and lush), unconstrained (entireIy free), at home in every rural setting (the hayfield or the river). On the opposite bank, all stress and hyperactivity (like a speeded-up corncrake), behold an angler whose reel sounds mimic the bird’s rasping calls (a sharp ratcheting went on and on), disturbing the stillness as he wound his line in (gathered line-length). Revenant Heaney still standing there, awake and dreamy is watching events from a new vantage point: I have grown older and can see them both deeply involved in the challenge (working away … absorbed), their differences loud-and-clear in the phrases Heaney associates with them (proofed by the sounds he’s making). One reverts to put-down ‘You are not worth tuppence, But neither is anybody’) based on imperatives of knowing one’s place and not being soft-hearted (‘Watch it! Be severe’) The other is laid back (‘Go with it! Give and swerve), milking whatever pleasure he can from the experience: You are everything you feel beside the river. Heaney can go with either: the easy-going calm of the one (I love hushed air); the open perversity of the other (I trust contrariness). He has seen no need to choose between them (I do not move): they are engaged at different points of the same activity (when one man casts, the other gathers and then vice versa); they have remained true to themselves without changing sides. In Heaney’s eyes they have not grown old, age has not wearied them. Heaney revealed to DOD (p95) that he was not a seasoned fisherman himself: I wanted to fish with a fly and just never stayed at it long enough to cast, so that effort fizzled out …But inside my sixty-eight-year-old- arm there’s a totally enlivened twelve-year-old one, feeling the bite. Two great friends were dedicated anglers: Yorkshire born poet Ted Hughes, regarded by many as the best poet of his generation, to whom the poem is dedicated and with whom Heaney collaborated; artist Barrie Cooke who appears later in Lightenings xii. MP 220 The music of fishing, its swishing and whispering and sharp ratcheting, is vividly caught in ‘Casting and Gathering’, another of those Heaney poems in which the twin voices of his education collide and Repeatedly in Seeing Things it is the unpredictability and change­ ability of water and sky which excite the poet and prompt new and unusual angles of vision. what could be an image for Eliot’s ‘auditory imagination’ itself, ‘Each one absorbed, proofed by the sounds he’s making’, and therefore the opposite of sound-proofed.